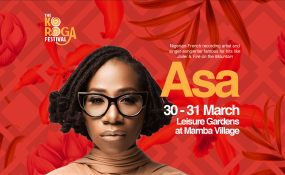 Asa to headline the 25th Koroga Festival. Asa - 10 of the best. It's a good feeling knowing you belong to someone and they belong to you and you both declare it. Every day you wake up, you know he or she is yours. This one gets you on your feet dancing and shaking your body to the rhythm with your group of friends. Bibanke, which she says, means when I cry, is truly a beautiful poetic love story. Love is a very beautiful thing but somehow somewhere it all goes wrong, leaves you broken holding onto something that ended ages ago but hey, you still love and want it so bad. This song leaves you in tears reminiscing about that dying love as you look out the window as it rains (beautiful tears, if that's possible). The perfect Karaoke song that finds the entire crowd singing and most importantly, waving their hands in the air from side to side. She says the song title is a metaphor. "Whichever way you look at it, there's fire--trouble. Things are not always rosy and things are not always beautiful. Every day we hear of bizarre things and we can't help but wonder, "Where is this world going?" We have to remind ourselves of that sometimes." There are times you just can't let go of someone you used to love or still do, but he or she is gone. You keep holding on to something that already ended, knowing how hard it is let the ones we love go, but it is also necessary to do that in order to make your life and the life of those you love much better in the future. You stand at the door still hoping he or she will be back. Asa delivered such an excellent raw rich performance here.